Here are a few. There is a very faint purple tint to it. 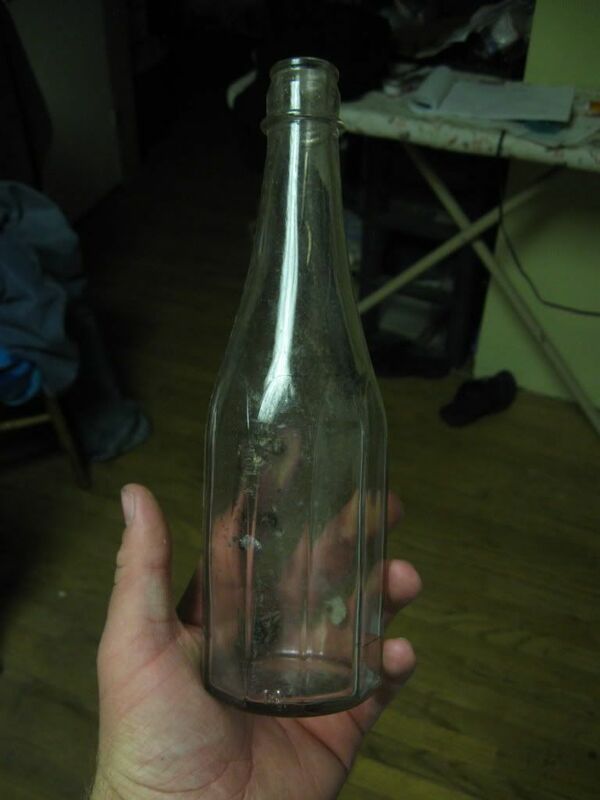 Im thinkin it started life as a clear bottle. A picture says it all. This ad is from 1929 - your bottle may be a bit earlier or later of course. The presence of manganese in some form in the glass causes glass to turn purple when exposed to UV /sunlight. The purple may become darker if you keep the bottle in bright sun over time. Actually, bottles are exposed to radiation at food processing plants. I know the person here in the northeast who is doing this on a large scale - the irradiating is done in Massachusetts. It is my understanding that even in strong sun, the color change takes quite a long time. The cause is the same -- i believe it is alpha radiation but several pseudo-experts I just checked claim it to be the ultraviolet part of the light spectrum. By both sun-exposure & irradiation, it is manganese used as a decolorizing agent that turns amethyst purple. The story has been told so many times by so many well-intentioned but un-scientific collectors that the details get blurred (I just spotted a website with one version of the story claiming Magnesium ! is the chemical. No, Manganese, not Magnesium!) 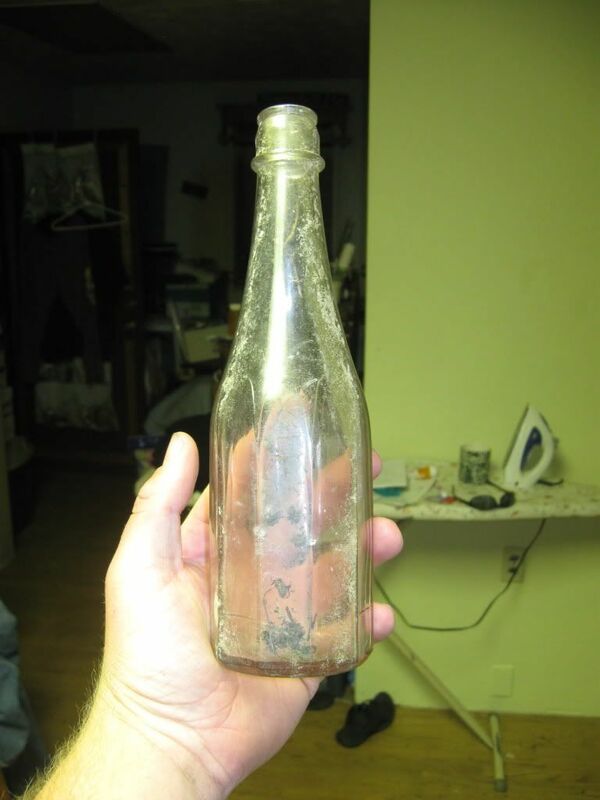 But this source does point to the presumed year 1915 as the cutoff for when American clear glass chemistry changed to use a different decolorizing agent; I suggest arsenic, this source says selenium, I think both have actually been used, but not Magnesium. See Elaine Henderson's website http://www.patternglass.com/sunpurple.htm ...her home is Phoenix AZ where every antique shop has old purple glass, real-fake-reproduction. 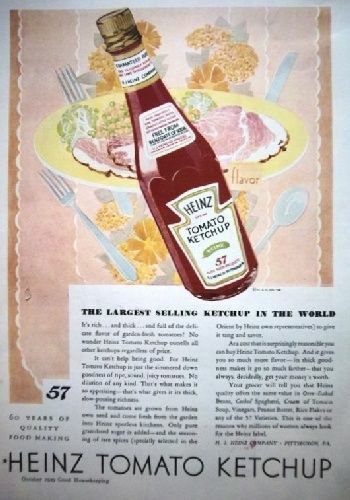 bottles were decolored so consumers could SEE the product more appealingly...since food, etc. looks Better thru "clear" (colorless) glass than aqua-tinted (natural color of glass). Manganese use was discontinued around 1920 as a decolorant primarily because it did not work too well in bottle making machines (less than 15% of the manganese came from Germany, so WWI wasnt the reason for its discontinuance). Some small scaled manufacturers or those still blowing by mouth continued using it however for a few years more. And glassware vessels may have had it in their formula till the 1930s. ??? 2006	The Color Purple: Dating Solarized Amethyst Glass Containers. Historical Archaeology 40(2):45-56.